Click the trail name for a printable version of that trail. Ashland Ski Trails: Most trails provide a combination of skating and classical skiing with two trails for classical only. The trails are gently rolling to flat terrain meandering through pine forest comprising several loops totaling 5 kilometers. The trails are maintained by volunteers. ASTA (Ashland Ski Trail Association) receives no funding from city, state, or federal governments. They ask for a nominal $3.00 donation when using the trail to help continue the operation and maintenance of the trails. Directions: From U.S. Hwy. 2 turn south on Beaser Avenue. Travel approximately 1 mile to Maple Lane. Turn right on Maple Lane and travel west to the third driveway on the right. Turn right into the parking area. Conditions on 003/26/2019: The Ashland Ski Trails are soft at this time and not groomed. Poor condition. Chequamegon Bay Golf Club Cross-Country Ski Trail, 3000 Golf Course Road. You can catch the trail just west of the 19th hole (clubhouse). Nestled among the trees and rolling terrain overlooking the Chequamegon Bay of Lake Superior, Chequamegon Bay Golf Club is one of northern Wisconsin’s finest golf challenges. Enjoy some of the area’s most awe-inspiring scenery as you ski this trail. Conditions: 3/26/2019, The trail is closed. Do to ice under the snow this trail will not open in 2019. No Dogs and No snowshoeing on the groomed trails. Snowshoeing is allowed next to the cross county trails. One important reminder: No dogs or snowshoes are allowed on these trails. Copper Falls State Park: Trails come complete with spectacular river scenery, including copper-colored water and numerous frozen rapids and waterfalls. The park has four classic-only loops, beginner-intermediate, totaling 11.4 km. Copper Falls also boasts two skate/classic combination loops totaling 10.5 km. All of the park’s trails are generally well-groomed and maintained. Conditions on 03/26/2019: All trails are open. Come and enjoy! Please call 715/274-5123 for the most up-to-date trail conditions. You will need a current parking pass to ski or hike these trails. Please remember: Pets are not allowed on the winter trails aside from the 2.5-mile Red Granite Falls trail, where they are welcome as long as they are on a leash and under control. Penokee Mountain Trail: One-way interconnecting loops in the Chequamegon National Forest. More Difficult/Classical. Directions: From Ashland, drive south on State Hwy. 13 for 24 miles to Mellen. Turn right (west) on Hwy GG and drive 3 miles to trail. Conditions on 03/09/2019: Groomed 3K & 5K loop. Not grooming 8K loop this year. For the most up-to-date trail report, please call 715/264-2511 or 715-634-4821. The main trail runs from Big Bay Road to Middle Road – and the Nucy Meech Trail runs off the main trail. With towering snow covered pines around, it’s a perfect spot for snowshoeing or cross-country skiing at an easy pace. Directions: The Capser Trail is located about 1/2 mile from the ice road approach – across from the La Pointe Fire Hall on Big Bay Road. State Park vehicle stickers or a daily fee is required. Directions: To get to Big Bay State Park from the ice road approach in La Pointe: Once off the ice road, take a right on Sunny Slope Road and travel approximately .5 miles to Big Bay Road. Take a right on Big Bay Rd. and travel approximately 4 blocks to Middle Road. Take a left on Middle Rd. (will eventually turn into Hagen Road) and follow the State Park signs for approximately 7 miles to the entrance of Big Bay State Park. Conditions: The trails at Big Bay are all-use and will be packed during the winter but not groomed. Mt. Ashwabay offers cross-country skiing in a magnificent setting featuring stunning views of the Apostle Islands National Lakeshore and the Chequamegon National Forest. Cross-country trails cover 30km with ratings from beginner to expert. All trails are groomed and tracked weekly or more frequently as necessary. The cross-country trails are open for snowshoeing, and the same trail fee is good for either XC or snowshoes. Directions: From Ashland, take U.S. Hwy. 2 west to State Hwy. 13 north. Continue on Hwy. 13 through Washburn, then drive about 10 miles toward Bayfield. Turn left on Ski Hill Road. Comments: For the most up-to-date report, check their Facebook page for status updates, https://www.facebook.com/mtashwabay, or call 715/779-3227. FAT BIKE TRAILS: Fat bike trails have not been groomed yet, but we will post updates here as we get them. Mt. Valhalla – Teuton and Valkyrie Ski Trails: Valhalla Winter Sports Area is nestled in the Chequamegon National Forest. It offers two systems of cross-country ski trails developed by the U.S. Forest Service and groomed by local volunteers. The three Valkyrie loops run through red and Jack pine forests, with magnificent views of the area on the Sun Bowl Loop. The Teton Ski Trail also features three loops in a mixed birch and maple forest with a roller coaster near the end of Loop B. C Loop is groomed for skating. Valkyrie loops are easy and good for classic and skating. Teuton loops are classic and more difficult. Directions: Take U.S. Hwy. 2 west. Turn left on Hwy. 13 north. Follow Hwy. 13 for 6.7 miles to County Hwy. C in Washburn. Turn left on Hwy. C and drive 8.5 miles to the trail head. Conditions on the Teuton and Valkyrie trails 03/11/2019: rolled and groomed. Please note that fat tire bikes are not an authorized use on any of the trails. Many roads across the forest are packed down by snowmobile use and maybe utilized for fat tire bike use. Pick up your Motorized Vehicle Use Map (MVUM) to see what roads maybe available to ride. The warming room and chalet are open for the season and also have maps and information. Report any new down trees that need to be cut off the trails at (715) 373-2667 and select 1 from the menu. The parking lots, paths, and around facilities are icy- please use care when walking or driving. A big storm with lots of snow is needed now!! Trails are reported in fair condition for bikes and snowshoes. Please remember: Snowshoeing, Fat tire bikes and dogs are prohibited on the groomed cross country trails. See the posted instructions at the trail entrances, chalet, warming room, and fee stations. Copper Falls State Park: Trails come complete with spectacular river scenery, including copper-colored water and numerous frozen rapids and waterfalls. The park has two loops designated as snowshoe/walking trails totaling 5.5 km. All of the park’s trails are generally well-groomed and maintained. NOTE: Hikers and snowshoers are not allowed on designated cross-country ski trails when the trails are snow-covered. Northern Great Lakes Visitor Center allows guests to check out snowshoes and use them on the trails behind the center. Both youth and adult sizes are available. As of 03/04/2019: Snowshoe Trails are open. St. Peter’s Dome is another great place to snowshoe! The hike to St. Peter’s Dome is 3.6 miles round trip. The trail has moderately steep climbs. It is a good idea to take water along on this hike. To reach St. Peter’s Dome, cross the log bridge over Morgan Creek where the trail forks and hike up the gradually climbing trail. Soon you will come upon an old campground that was built by the Civilian Conservation Corps in the 1930s. The old brick fireplaces, an artesian well, and a round cistern are all that remain of the campground. The trail becomes narrow as you walk across much steeper slopes. There is a lake-sized beaver pond to your left. As you continue east, the trail drops in elevation and crosses a rocky streambed. Beyond the stream the trail becomes steeper and the tread is rocky. In a bit, the grade becomes more gentle and you cross a snowmobile trail. At the base of the granite outcrop that is the dome, you will find a jumble of large broken rock from the quarry. The trail follows the old road for a hundred feet and then turns left off the road and begins to climb in earnest. After two switchbacks, the trail reaches a grassy opening. Continue along the trail and climb to the overlook and sheer drop on the north face of St. Peter’s Dome. On a clear day, you can see the Chequamegon Bay of Lake Superior and the Apostle Islands. Directions: From Ashland, drive south on State Hwy. 13 about 13 miles to County Highway C (about 1 mile south of Marengo). Turn right on Hwy. C and follow it 4.8 miles to Midway Road. Continue straight on Midway Road 1.2 miles to County Line Road (FR 199). Turn left (south) on County Line Road and drive 3.9 miles to the parking lot, which is on the left (east) side of the road. Conditions: OPEN to snowshoeing as conditions allow. 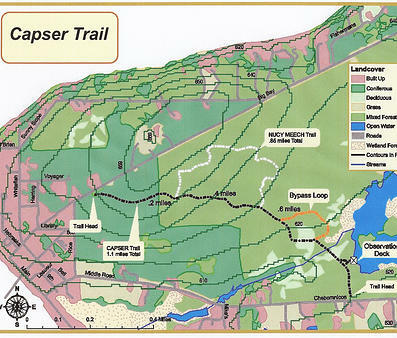 The Capser Trail on Madeline Island: The main trail runs from Big Bay Road to Middle Road – and the Nucy Meech Trail runs off the main trail. With towering snow-covered pines around, it’s a perfect spot for snowshoeing or cross-country skiing at an easy pace. Directions: The Capser Trail is located about 1/2 mile from the ice road approach – across from the La Pointe Fire Hall on Big Bay Road. Big Bay State Park: State Park vehicle stickers or a daily fee is required. Directions: To get to Big Bay State Park from the Ice Road approach in La Pointe: Once off the ice road, take a right on Sunny Slope Road and travel approximately .5 miles to Big Bay Road. Take a right on Big Bay Road and travel approximately 4 blocks to Middle Road. Take a left on Middle Road (will eventually turn into Hagen Road) and follow the State Park signs for approximately 7 miles to the entrance of Big Bay State Park. Houghton Falls: To get to Houghton Falls, take U.S. Hwy. 2 to State Hwy. 13 north of Ashland and travel 3.5 miles north of Washburn on Hwy. 13. Turn right on Houghton Falls Road and go 1/2 mile to Houghton Falls Nature Preserve parking lot on your right. There is currently no fee for hiking or parking and pets are allowed if leashed and cleaned up after! Mt. Ashwabay offers both cross-country skiing and snowshoeing in a magnificent setting featuring stunning views of the Apostle Islands National Lakeshore and the Chequamegon National Forest. The XC trails are open for snowshoeing, and the same trail fee is good for either XC or snowshoes. Click here for a PDF version of Cross-Country Skiing and Snowshoe trails. Co​nditions: 03/09/2019 All runs are open with 12-36″ of base and more to come. The hill is in about as good of shape as it can be. RENTALS * Don’t have skis or snowshoes? Solstice Outdoors, 2521 W. Lake Shore Drive, 715-682-3590, rents both! Northland College Outpost, 1411 Ellis Avenue, 715-682-1265, rents both! Mt. Ashwabay: There’s more to our ski hill than just skiing and snowboarding. Kick up your feet and enjoy a ride on our new lighted tubing lanes. Our new tubing lift makes it easy to ride again and again! Mt. Valhalla – Valkyrie Ski Trails: Valhalla Winter Sports Area is nestled in the Chequamegon National Forest. It offers two systems of cross-country ski trails developed by the U.S. Forest Service and groomed by local volunteers. The three Valkyrie loops run through red and Jack pine forests, with magnificent views of the area on the Sun Bowl Loop. The Teton Ski Trail also features three loops in a mixed birch and maple forest with a roller coaster near the end of Loop B. C Loop is groomed for skating. Valkyrie loops are easy and good for classic and skating. Teuton loops are classic and more difficult. FAT BIKE TRAILS: The Washburn Ranger District in partnership with the North Coast Cycling Association (NCCA) is allowing fat tire bikes and snowshoes on the left half of the trail tread on Loops A, B and Little A for the Valkyrie Trail System this winter. Under this agreement, NCCA will be hosting events to educate first time users about biking, snowshoeing and winter trail etiquette. Members will also be out on the trails as trail ambassadors to talk with visitors and provide information. Please remember: Snowshoeing, Fat tire bikes and dogs are prohibited on the groomed cross country trails. See the posted instructions at the trail entrances, chalet, warming room, and fee stations. Mt. Ashwabay: New this year is the Sugar Bush Dog Trail. For more information click the link.